Unused Wapato Jail contains $600,000.00 of art and no inmates. We are now fast approaching the two-year anniversary of Occupy Portland, whose members illegally occupied Lownsdale and Chapman Squares in downtown Portland for six weeks in October and November 2011. While most of the media and public attention focused on the circus unfolding across from Portland city hall and the Portland Building, a few blocks away at 4th Avenue and Burnside Street another protest camp was setting up shop on private – not public property. A newly formed nonprofit group, Right 2 Dream Too, had “rented” for $1 dollar per year a vacant lot owned by Michael Wright, who has had his own long-running beef with the city after former Commissioner Randy Leonard forced the closure of Wright’s Cindy’s Adult Bookstore in 2007. The “tenants” then proceeded to erect a couple dozen tents on the paved surface, a practice that eventually generated thousands in fines and a lawsuit by the campers against the city. Fast-forward to Fall 2013 and Occupy Portland is mostly a bad and at times amusing memory for law-abiding residents and tax payers of Portland. Last month a seven-member federal jury in Portland took less than four hours to clear Portland Police officers of allegations of excessive force in a civil suit brought by activist and protester Liz Nichols, who received a mouthful of pepper spray from one of Portland’s finest. Nichols’ loud mouth encounter with Sgt. Jeffery McDaniel became permanently memorialized in Oregonian photographer Randy Rasmussen’s iconic image that has come to define the six-week siege. Today, the Occupy Portland movement has been reduced mostly to a Facebook page that boasts more than 29,000 “Likes” and 23,000 “Talking About” numbers, as if those Facebook metrics actually translate into effective political power. While the Occupy movement has become “so 2011,” the Right 2 Dream Too movement continues to present troublesome issues for Portland city hall in general and council member Amanda Fritz in particular. In the latest development between the parties, Fritz recently announced the camp can now move and set up on city-owned property under the Broadway Bridge in the Pearl District. The deal brokered by Fritz was an effort to head off a pending lawsuit filed by the homeless group as well as resolving $25,000 in city fines racked up by the campers for violating the city’s code. While Fritz may have ended one litigation, she likely triggered another, as the Pearl District Neighborhood Association recently announced that it is prepared to spend $10,000 in association dues to ensure the city follows every city code and process in its effort to grant Right 2 Dream Too campers the right to occupy city property with impunity. As this seemingly never-ending drama plays out between liberal progressive politicians and activists, the public continues to hear the familiar refrain from homeless advocates that the Portland-Multnomah region sorely lacks enough adequate shelter beds for temporary, transitional housing, residential treatment for addiction and mental health problems, warming shelters, etc. Meanwhile, in North Portland, a $58 million, never used facility sits idle and unused, complete with 525 beds, an industrial kitchen, medical and dental facilities, office space for counseling services and more. It’s time to Occupy Wapato. Wapato bunks could be used to house homeless? The stigma of the Wapato Facility as an albatross around Multnomah County’s neck is mired in the economics and politics of the mid-to-late 1990’s. In May 1996 (yes, it has been that long) Multnomah County voters approved Measure 26-45, a $79,700,000 bond authorization to finance the construction of public safety facilities and equipment in the county. 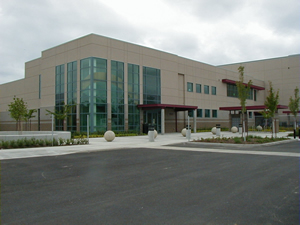 The bond proceeds were used to build the Children’s Receiving Center, build the Wapato Facility, add a dorm at the Juvenile Justice Complex, add beds at the Multnomah County Inverness Jail (MCIJ) and purchase computer applications for public safety use. It also provided funds to repair or remodel the downtown courthouse, Multnomah County Detention Center (MCDC), and transitional housing facilities. Constructing the Wapato Facility itself consumed $58 million of the $79 million voters approved. Meanwhile, the State of Oregon was engaged in a prolific expansion of its state prison system. Then-Sheriff Dan Noelle also believed the county would need greatly expanded corrections capacity in the immediate and foreseeable future. But Noelle met stiff resistance from former Multnomah County Chair Bev Stein, who argued that treatment and prevention was more effective than pure incarceration. In a compromise that helped pass the measure, Wapato was presented (and later constructed) as a 525-bed hybrid facility consisting of 300 secure treatment beds and 225 regular jail beds, the difference being primarily module design, security, and operating department. Under the compromise, the county’s Department of Community Justice (DCJ) was to operate the 300 treatment beds, while MCSO Corrections would staff the regular jail beds, with MCSO having overall charge of the correctional facility. After years of difficult siting issues, Wapato construction finally began in 2002 on an industrial site near Smith and Bybee Lakes in North Portland west of the Expo Center. Construction was completed in 2004, recognized in an anti-climatic “grand opening” in July 2004. The dedication ceremony consisted of former Sheriff Bernie Giusto and others cutting the ceremonial ribbon, followed by locking the doors and leaving – both literally and figuratively, for good. Ever since, Multnomah County taxpayers have spent between $300,000 and $400,000 per year just in maintenance costs to keep the 170,000 square foot facility from falling into complete disrepair before it’s ever used for its intended purpose. Six months after Multnomah County voters passed Measure 26-45, Oregonians at the November 1996 general election passed Measure 47, a citizen initiative that would have rolled back property taxes (but not assessed values) to 90 percent of the 1995-96 level for each property in the state. In response, the 1997 Oregon legislature referred to the voters, who later approved, Measure 50, which repealed Measure 47, while keeping the former measure’s tax cuts. A complete discussion of Measure 50 is beyond the scope of this article, but the impact on local property taxes was immediate and profound. Under Measure 50, the objective was to reduce property taxes in 1997-98 and to control their future growth. M50 achieved these goals by cutting the 1997-98 district tax levies, and by making three changes: switching to permanent rates, reducing assessed values, and limiting annual growth of assessed value to 3%. For example, In 1995-96, when the Wapato measure was approved, assessed and real market values of real property were equal, and taxed accordingly. Under M50, for 1997-98, the assessed value of every property was reduced to 90 percent of its 1995-96 assessed value. The effects of M50 had varying impacts throughout the state because growth in value had not been uniform throughout the state. Properties that had experienced the greatest value growth between 1995-96 and 1997-98 received the greatest cuts in assessed value and consequently, in taxes. For property owners, M50 represented much-needed property tax relief, as did Measure 5 years earlier. But for local governments, including Multnomah County, Measures 47 and 50 resulted in a loss of general fund revenue and all but ensured the Wapato Facility would never be opened. In many ways, the Wapato Facility became Dan Noelle’s Field of Dreams facility, sold to the public on the promise that “if we build it, the inmates will come.” In the mid-1990’s the economy had recovered from the 1990-91 recession and things were booming, even in Oregon. Many honestly believed that rising property taxes due to ever-increasing home values would easily cover not only the cost of paying off the bonds, but also generate general fund revenue to operate the facility, since the Measure approved by voters was for construction only, and did not include an operating levy. But the boom times of the mid 1990’s were quickly followed by the dot.com bubble burst and the mini-recession in 2000. Coupled with the impact of Measures 47 and 50, the Wapato Facility project was doomed to become a $58 million boondoggle that continues to confound and frustrate elected leaders and taxpayers to this day. In the nearly ten years since Sheriff Giusto cut that ceremonial ribbon commemorating the completion, but not the opening, of the Wapato Facility, political leaders and others have struggled to come up with viable uses for the facility. To his credit, former Multnomah County Chair Ted Wheeler vowed to open Wapato as a correctional facility, even at the expense of closing down jail beds at MCDC, MCIJ or both. But despite his best effort and intentions, Wheeler’s plan proved to be more expensive and less efficient because of the need to replicate corrections services – including transportation, medical, detention and support staff, etc – spread over three disparate facilities instead of just two. In the end, Wheeler’s proposal was never adopted, nor were other piece-meal efforts by the Sheriff and other county leaders to at least partially open Wapato for local correctional use. MCSO also pitched Wapato to the state’s Department of Corrections for use as a local state prison, particularly for state prisoners in the final year of their sentences to transition back into their local communities. But Wapato was designed and built as a local correctional facility and not a prison – a distinction without a difference to most citizens. But it is a distinction that is real, and which eventually resulted in DOC’s rejection of Wapato as a state prison. Others have suggested Wapato would make a terrific hotel, casino or combination of both. County officials approached the McMenamin’s, who had previously converted the county’s Troutdale property to a landmark success. But Wapato is no Edgefield, and that idea went nowhere. Wapato has enjoyed some recent success as a filming site for television and motion picture production, but that is analogous to a celebrity athlete or Hollywood star eking out a living signing autographs instead of actually performing their craft. Worse for taxpayers, because of restrictions in the bonds that are not yet retired, the county cannot rent out the facility, and thus charges film crews only the nominal cost of utilities and security, effectively granting film crews free use of a never-used public facility. The fact remains that Multnomah County tax payers expected and expect the Wapato Facility to be used as a correctional facility. But that expectation is not likely to be realized in the foreseeable future. At the height of Noelle’s tenure as sheriff in 1999-2001, Multnomah County operated five correctional facilities with a capacity of 2,037 inmates. And that did not include Wapato, which was not yet built. Today, the county commissioners give the Sheriff funds to operate only 1,310 jail beds. The downtown MCDC, designed with a capacity of 476, today holds a maximum of 448. The Inverness Jail in Northeast Portland has a capacity of 1,037 inmates. But with three large dorms closed, MCIJ today is capped at 862. If anything, it is clear with MCDC and MCIJ operating below capacity, Wapato will not see a jail inmate inside its walls unless or until one of the two existing jails close for good. Yet ironically, Wapato may provide Multnomah County with the next best thing – a state-of-the-art facility to deliver shelter and services to homeless individuals and families who genuinely desire and deserve the community’s support. The idea of using Wapato as a homeless shelter is not a new idea. In fact, after Hurricane Katrina struck the Gulf coast in 2005, Sheriff Giusto offered Wapato as shelter for New Orleans refugees who may be headed to Oregon. But the stigma of housing out-of-state refugees – many of whom would likely be African-American – in a jail was too much for Portland’s progressive political class to stomach and the idea was quickly dismissed. But if any facility was optimized for such a function, it is Wapato. Remember, that a majority of the 525 beds (300) were designed and built as secure treatment beds for clients of the county’s Department of Community Justice. The facility is easily segregated by gender, allowing for female-only dorms. Who knows, perhaps an entire wing could be dedicated as The Jeff Cogen Shelter for Mistreated Women. Funding such a massive program would require shifting existing resources now spread out over several nonprofit providers to consolidation under one very large roof, perhaps with those NGO’s providing the staffing to deliver those services. Today, Multnomah County alone spends millions of federal, state and local dollars providing services to the county’s homeless population. Yet we continue to hear complaints that there is not enough beds and facilities to meet the need of the growing homeless population. These DCHS Community Services Division programs do not include many related programs operated by the Mental Health and Addiction Services Division, which has a total budget of $99,716,689 for FY2014. For example, MHASD will spend more than $10 million in FY2014 to provide mental health residential services for individuals with a severe mental illness that require care in a 24-hour-a-day setting. To meet that need, the county contracts with licensed caregivers to provide mental health and social services in structured housing for adults with severe and persistent mental illness. The county will contract for a total of 382 such beds in 2014. But rather than have all of most of those beds in one modern facility, those 382 mental health beds are scattered among 64 separate facilities or homes. Is There the Political Will for Wapato? In December 2004, five months after Wapato was completed, the City of Portland and Multnomah County jointly published a 10 Year Plan to End Homelessness, an initiative to end homelessness in the city and county by 2015. While this laudable – and now laughable – goal seems hopelessly out of reach in late 2013, the Plan points to problems with our current approach which an operational Wapato facility could help address. The Plan consistently pointed to the lack of housing of all types, whether emergency shelters, transitional housing, or treatment beds. Wapato could fill any or all of those needs. One particular issue bears directly on a function for Wapato in connection with the county’s overall jail system. One of the Plan’s Nine Actions to End Homelessness is to stop discharging homeless jail inmates and hospital patients “into the streets” without linking those individuals to available services. 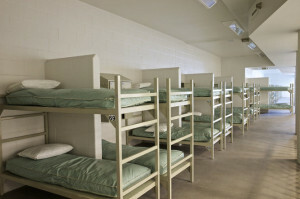 If Wapato were up and running as a homeless service provider, a discharged jail inmate could voluntarily elect to stay at Wapato rather than on a park bench, in a business doorway or under a bridge, where they are far more likely to engage in behavior that leads to additional police contact – thus perpetuating a very expensive and destructive cycle. As shown in the county’s adopted budget, there are tens of millions of dollars available to spend on the homeless and on those with mental health and addiction problems. Today those tax dollars are scattered across a patchwork network of nonprofit providers who need those public monies to survive. Injecting Wapato into that equation is bound to ignite some inevitable turf wars and self-protection battles. Also, as noted with the Katrina issue, city and county leaders are likely to reject the appearance of institutionalization of the homeless at Wapato, even if those receiving shelter and services are participating voluntarily, as with current programs. The key to making Wapato work for the homeless is a simple carrot-and-stick approach. Most will agree that among those camping illegally in Portland and surrounding areas are two broad groups of people: those who are truly down on their luck, who have lost their job in this dismal economy and need their neighbors’ temporary help to get back on their feet; and those pit-bull toting “road warriors” and similar scoflaws who choose to camp where they want, when they want and have little or no desire to do otherwise. Portland in particular has encouraged the latter while claiming to help the former. It’s time for some tough love in the City of Roses. When a person is found illegally camping on public property, the police officer should politely and compassionately offer that person two distinct choices if the camper doesn’t move: a citation or arrest for illegally camping, perhaps accompanied by a free ride in handcuffs to MCDC; or a free ride to Wapato where the person can get a hot meal, a warm and dry bed out of the elements, medical, dental and other services, and the freedom to stay or leave when they want. Or we can wait until the Wapato bonds are paid off in 2016, cut our collective losses and sell the place to the highest bidder while city and county officials wonder what went wrong with their 10-year plan to end homelessness by 2015. SuRpriSe! Saturday Night Live Lampoons ObamaCare. There’s always a first. Saturday Night Live lampoons ObamaCare. Saturday Night Live lampoons ObamaCare. Pete the Banker: Who’s to Blame? 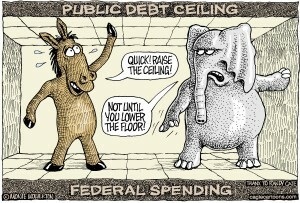 Debt Ceiling Debate Reflects Political Red Lines. 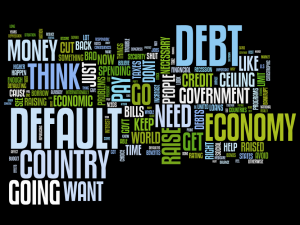 Debt Ceiling Politics Pervades Washington, D.C.
Word cloud of Democrat Senator Chuck Schumer’s speech on debt ceiling. Ah, the mystical and mischievous workings of Washington, DC. And now President Obama in 2013, Obama: No Negotiation. And the esteemed Senator from Tennessee Robert Corker: No transparency. That old adage that “the more things change, the more they remain the same” certainly seems to pertain to Washington, DC. And the old guard based upon the actions of the Senate on Friday morning retain full control. And so who is to blame for the confusion, impasse’ and pending government shutdown? Subject: Re: Pete, help us defund ObamaCare! Thank you for the email. I would like to think that Republicans are affording a “united front” in opposing Obamacare as stated by Senate Minority Leader McConnell. The Affordable Health Care Act will cause massive damage to the healthcare system and the quality of healthcare in this country. I find however that all our political institutions have failed in preventing the destruction of low cost, high quality private healthcare in this country. I was lied to by the Executive branch when told I could keep my doctor and my health insurance. I have lost my doctor and will lose my so called “Cadillac” health insurance next year. I was lied to about health insurance costing less. The Judicial System, the alleged protector of the Constitution, further embraced this monstrosity by characterizing the healthcare mandate as a “tax”, despite the Administrations insistence it was not a tax. More word play; another lie and deception. The legislature including both houses as soon as they were faced with possible imposition of Obamacare personally ran to the President for a waiver which they gladly accepted. Pathetic!!! And now the Senate Minority Leader states that Republicans are “united” and yet I see only two Senators Cruz and Lee leading the attempt to defund Obamacare. Give me a break. Why isn’t Mitch McConnell up filibustering on behalf of the House passed bill. I am tired of the lies emanating from Washington DC. I am tired of those in Washington being treated under a better and different standard than the rest of the country. I signed your petition. Thank you. I would like to contribute, but need to see real change in those who assert that they are representing me. I realize this is basically the last chance to force the defeat of a highly unpopular piece of legislation. I would be glad to contribute, if I felt of that the Republicans were ready to take a real stand in an attempt to defeat Obamacare. But based on what I see today, most Republicans seem satisfied to simply give lip service to that concept and then cower away. This country was been built on the sacrifice and blood of prior generations who were often called upon to defend their beliefs despite significant personal loss. When are those of us on main street going to be represented in Washington DC by individuals who will risk their position to uphold our values and beliefs. I am sorry to be so direct, but I expect honesty and results and I see little of either in Washington DC at this moment. ObamaCare killed my brother in law, Dr. Philip Henderson, III of Longview. Here’s a letter I wrote to the email set up to tell our ObamaCare stories: obamacare@mail.house.gov. Add yours in the comments of this website if you can. I hope you de-fund and kill ObamaCare. ObamaCare killed my brother in law. An outrageous thing to say? Listen to this shortened version of this story and see if you don’t agree. My brother in law, Dr. Philip Henderson, III of Longview, Washington, was a fourth generation doctor in this medium sized logging town in Cowlitz County in Southwest Washington. He was responsible for bringing 6,000 babies into this world. He started programs to help poor women receive prenatal care, helped out at a free clinic he helped start, gave thousands of hours –totaling five years–of his own, unpaid time to cover OB-GYN emergencies at the local hospital AND he volunteered for ten years at both local high schools to give teens “the talk.” He lobbied Senators and Congressional reps in Washington, D.C. in an attempt to slow the debilitating effects of ObamaCare on women’s health care in Washington State. He was a community treasure. Loved. Respected. See the stories about his life HERE,HERE, HERE, HERE, HERE and there are many others. See the pictures attached. 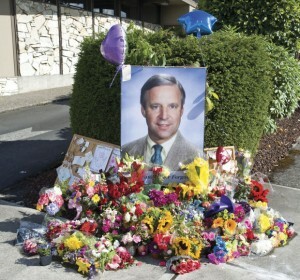 A spontaneous memorial appeared outside of the Lower Columbia Women’s Clinic after word spread of Dr. Henderson’s death. Vancouver, Washington to receive care. My brother-in-law’s practice would lose their patients. More important, their patients would not be able to keep their doctor–a promise made by the President about ObamaCare. During these difficult negotiations, two of the partners decided to leave to seek greener pastures. They knew it would collapse the clinic, but, undaunted, Dr. Henderson and his remaining partner turned to the local hospitals they served to get a temporary financial life line until they could hire replacements and get the clinic whole again. The hospitals said no. ObamaCare was putting the hospital in a squeeze and they couldn’t afford to help the Doctors who had given thousands of hours of free care to the hospital’s–and City’s–patients. Under ObamaCare, you see, only the large survive. Or the people who can exempt themselves, like Congress. Or friends of people writing the bill who give their friends waivers, such as unions and big corporations. When local hospitals turned down the financial life line, Dr. Henderson began searching for jobs for his co workers. He made phone calls on their behalf and helped their job hunting efforts. But the clinic his great-grandfather had started generations before would die. 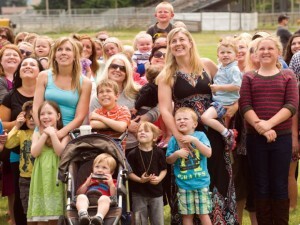 Some of Dr. Henderson’s patients and some of the children he’s brought into the world, pose for a memorial photo following his death. The Daily News Photo. The man who 20 years earlier had fought back and willed himself to walk after a devastating car accident and who worked hard to get back to his practice only to pour himself into his patients and his community, was a beaten man. It’s easy to see that now. It wasn’t in June. His wife and daughters surrounded him and began brainstorming ideas on what he could do to finish his career doing what he loved most: medicine. While he’d funded his own retirement and was only a few short years shy of that milestone, he still needed to work. He, like many Americans on their heels by the ongoing recession, had to keep working awhile longer. But the irony is when Dr. Henderson was ready to stand on his own feet, build on his own success, use his talent to embark on the last chapter of a spectacular career, it seemed everywhere he turned, ObamaCare was in the way. It was a huge stop sign on the bumpy road he, his clinic and his patients found themselves on. Then on June 7th, one week before his clinic closed, Philip took the Mossberg shotgun he bought to scare off a man who had been stalking a family member, and turned it on himself. The hard charging, can-do, lead-from-the-front, master-of-the-universe who fought hammer and tong for his patients, no longer had patients to fight for. ObamaCare turned a great man into no man. His family is devastated. His patients are sad and confused. This horrible economy has caused millions of people to lose hope. They’ve been so dispirited in some cases, that they’ve stopped looking for work or planning for success. They’re just trying to survive. ObamaCare has put another yoke on an already plodding economy. Not only is ObamaCare to blame for that, it now comes with a body count. I hope you kill ObamaCare. It’s bad for liberty. It’s bad for America. Anti ObamaCare ads are put out by a group called Generation Opportunity. And what ads these are! On a day that Republicans (and hopefully some Democrats) vote to defund ObamaCare in the House, this group urges individuals to opt out to keep Uncle Sam, well, out of your private business. And here’s one for you fellas! When she was cramming ObamaCare down our collective throats, she demonized health insurance companies for its role in individuals’ health care. Based on this appeal we can conclude Pelosi has figured out Americans like private health insurance companies in charge of their insurance better than massive government bureaucrats. Starbucks CEO’s Letter to Gun Owners: “Appreciate” Us Without the Guns. 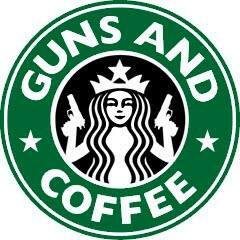 Starbucks CEO gives win to anti gun protesters, asking gun owners to leave the pieces either at home or concealed. The CEO of the ubiquitous Starbucks Coffee chain has taken out full page ads in major U.S. newspapers to placate anti gun activists who Howard Schultz claims have been hassling his workers and customers over the issue of guns in the shops. In an open letter (see it below) to customers which begins, “My Fellow Americans,” Schultz asks gun enthusiasts to stop appreciating Starbucks so much because it’s ticking off the anti gun folks. The Starbucks CEO has kept an open mind about open carry: if it’s legal to openly carry a gun in a state, Starbucks allows guns in their stores. And gun rights enthusiasts have thanked Starbucks by holding what they call, “Starbucks Appreciation Days” across the nation. They’ve shown their appreciation in a tangible way, giving Starbucks lots of business and on a bumper sticker. See it nearby. Recently, however, we’ve seen the “open carry” debate become increasingly uncivil and, in some cases, even threatening. Pro-gun activists have used our stores as a political stage for media events misleadingly called “Starbucks Appreciation Days” that disingenuously portray Starbucks as a champion of “open carry.” To be clear: we do not want these events in our stores. Some anti-gun activists have also played a role in ratcheting up the rhetoric and friction, including soliciting and confronting our customers and partners. Schultz’s letter attempts a nuanced stance: could you appreciate us WITHOUT the guns?! But the intent is unmistakable: gun enthusiasts are “disingenuous” about Starbucks’ motives while anti-gun enthusiasts are “threatening.” Who’s being asked to leave their rights at the curb? Gun owners. I’m not going to vouch for every gun enthusiast who may run his mouth off at a protester, but I’m sure as heck not going to vouch for the usual rent-a-mobs we often see hassling, yelling, chanting and screaming at their political detractors. I’ve seen this movie too often. Anti fur protesters screaming mere inches from customers and committing acts of vandalism, phony fast food workers on ‘strike,’ SEIU thugs beating a (black) conservative guy selling T shirts and racist and homophobic epithets hurled at conservatives (including blacks and gays) gathering for a meeting. Howard Schultz’s employees have seen them too. Does his letter ask those anti gun people to stop their collective hissy fits at his stores? No. He undoubtedly doesn’t want to spark a debate about first amendment rights. He is willing to ask second amendment enthusiasts to keep their guns at home, however. He forgot that gun owners are also his customers. But with his public disavowal of gun owners openly carrying, he has given anti gun activists what they want, showing once again that a few loud voices can eclipse actual civil rights. Our company’s longstanding approach to “open carry” has been to follow local laws: we permit it in states where allowed and we prohibit it in states where these laws don’t exist. We have chosen this approach because we believe our store partners should not be put in the uncomfortable position of requiring customers to disarm or leave our stores. We believe that gun policy should be addressed by government and law enforcement — not by Starbucks and our store partners. Compare and contrast. People smiling and drinking coffee juxtaposed to picketers. House Speaker John Boehner says Pete the Banker was right on negotiating with Russia and Republicans. Pete the Banker was right. OK, Speaker of the House John Boehner didn’t actually SAY Pete the Banker was right (in his previous posts here and here), but he did DEMONSTRATE that the Blogforce member is right. 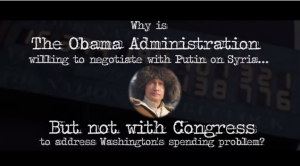 Today, the Speaker’s office released this video demonstrating the President’s willingness to negotiate with Russia’s President Putin on Syria’s chemical weapons while being unwilling to negotiate with the GOP and force a government shut down over the debt ceiling. President Obama issues red line to Republicans on debt ceiling, refusing to negotiate. President Obama promised to transform America and he has kept this promise. With the de facto capitulation of President Obama and Secretary of State Kerry over Syria, and with Russian President Putin now very much in control and humiliating the United States in the pages of the New York Times, the towering peril to the world is now the re-invigorated Russian support of Iran. Equally, the Iranian mullahs support Syria financially, militarily and with Iranian boots on the ground. And behind Iran and Syria is the ever protective Russian veto in the UN Security Council. Then, too, there is the Russian plan to pipe oil from Iran through its Syrian client to the Eastern Mediterranean or through Turkey. The stench of Middle Eastern oil permeates much of the political maneuvering that afflicts the world. Alas, Obama and Kerry have allowed Russia to reassert itself in the Middle East, which it had not been able to accomplish since the Arab aggression against Israel during the Yom Kippur War in 1973. Putin has followed up on his diplomatic coup against the United States by offering to provide the Iranian mullahs the S-300 missile, which will drastically alter the balance of military power in the Middle East and imperil Israeli or U.S. aircraft should an attempt be made to end Iran’s aggressive nuclear weapons program. Also, there are reports that prior to John Kerry’s meeting with Russian Foreign Minister, Sergei Lavrov, the Obama Administration had begun removing some of the financial and economic measures that had been in place against the Iranian regime. There is, no doubt, much rejoicing in Teheran over the Syrian debacle. Remember, during his first tour to the Middle East – after making the astonishing claim that the US was one of the foremost Muslim countries in the world – Barack Hussein Obama bowed low to Saudi Arabia’s King Abdullah and then went on to apologize to an assorted gathering of Arab sheiks, emirs, princes, dictators and tyrants for America’s past defense of freedom and liberty around the world. Obama said the US had been “arrogant, derisive and divisive” and would no longer be an exceptional nation under his watch. Remember, too, that Obama cancelled the American missile shield in eastern Europe to the dismay of Poland and other eastern European allies which needed the shield for their protection from Russian and Iranian threats. Obama was also over heard on a hot microphone assuring Russian leader Medvedev that he would be “flexible” in missile defense negotiations once he was re-elected. Well he has been most flexible, as the Syrian fiasco has proven. America’s traditional allies have had to re-adjust their foreign policies because they now know that Obama does not say what he means or mean what he says. Our enemies are emboldened because they already know it. The North Koreans are re-starting their nuclear reactors and Iran is speeding up its nuclear program with Russia’s help knowing full well they have nothing to fear from Obama, nor Hillary Clinton if, heaven forbid, she succeeds him. The proliferation of weapons of mass destruction (WMDs) as in the case of the estimated 1,000 tons of Sarin nerve gas, biological and other outlawed weapons in the hands of Syria’s al-Assad, or the potential transfer of such hideous armaments to the Muslim Brotherhood, Al Qaeda or Hezbollah, transforms dangerous threats into hideous and actual nightmares. It encourages Iran’s genocidal ambitions and pursuit of nuclear bombs and it poses a mortal threat not only to Israel but to Jordan, Saudi Arabia and what few oil producing Arab countries remain relatively free from Islamic and jihadist influence. The so-called Arab Spring, which was never to be about democracy in the Islamic world, has now morphed into an increasingly anti-US, violent jihadist Islamic triumphalism. Islam, after all, means submission to the will of Allah not, as in a democracy, to the will of the people. And those in the West who endlessly call for democracy in the Arab world should read the Koran and finally be disabused from uttering such foolish and naïve statements. President Obama, true to his ambition to “fundamentally transform America” has made the U.S. appear weak and unwilling to support its allies around the world. As a result, many erstwhile allies of the U.S. have felt alienated, used and abused by the American president and have withdrawn their support – especially Britain and NATO – over the Syrian situation. All this could be construed as the utter incompetence of the Obama administration but I fear it may well be one more deliberate step in President Barack Obama’s promise to “fundamentally transform America” to that of a weak European style nation state like Belgium and destroy irrevocably America’s exceptionalism and power to keep the peace in what is fast becoming an increasingly perilous world. Both Hilary Clinton and her successor, John Kerry, were firmly convinced that Syrian President Bashar al-Assad was a reformer and a man of his word. Indeed Kerry flew frequently to Damascus, dined with Assad, whom he called his friend, and was sure that Bashar Assad was a true partner in peace. But Secretary Kerry appears to possess a naïve vision of the Middle East, arguably the worst neighborhood on the face of the planet. He seems unable to grasp the grim reality of an ever more powerful explosion of radical Islamist triumphalism threatening to sweep over Jordan, Lebanon, Iraq, Kuwait, Saudi Arabia and then to inexorably threaten what the jihadists call the “Dar al-Harb – the House of War,” namely what they insultingly refer to as the infidel world of Israel, Europe, Britain, America and the entire non-Muslim Free World. We, in the West, are in peril when even John Brennan, the CIA Director who advises President Obama on international terrorism, himself does not recognize the existence of Islamic or Jihadist terrorism. Then there is James Clapper, our Director of National Intelligence, who two years ago called Egypt’s Muslim Brotherhood a “largely secular” organization. This breathtaking leap into unreality is by the same James Clapper who many believe is now utilizing the NSA to spy on Americans. And the Obama Administration itself has ruled out the use of the word Islam in any references to terrorism against America. After all, it was the Obama Administration which insisted upon calling the massacre of unarmed American soldiers at Fort Hood by the Islamist, Major Nidal Hassan, not terrorism but an act of “workplace violence.” When a government refuses to even name its enemy, it has almost lost the war for civilization. This piece first appeared on Renew America. He is an author, musician and expert on the Middle East. The media predict a war. Obama has fired the first salvo. Obama may be manipulating the debt ceiling discussion to use as wedge issue for 2014 elections. The mainstream media in past week loudly proclaimed the futile attempts of Boehner to seek votes in order to pass debt ceiling without shutting down government and also proclaimed the pending “Republican civil war” over the issue. While Speaker Boehner was trying to avoid a stalemate, President Obama on Sunday insisted on Sunday, “No compromise”. He again drew a line in the sand, this time challenging the Republicans not to cross. He stands in support of his grossly unpopular legacy legislation ObamaCare and is willing to throw the country into chaos in order to preserve it. It is not Boehner, nor the Republicans that fired to first salvo, but Obama. Confusing since back in his first statement Obama indicates he will not compromise despite apparently being sent to Washington DC by the voters to do so. Hum??! Or is it? In fact, as Washington based reporters such as Bill Kristol, Jim Geraghty and Guy Benson believe (Hugh Hewitt Show 9/16), Obama wants a shut down of government to use as a wedge for the upcoming 2014 mid term elections since Democrats are taking a huge hit in approval ratings due to ObamaCare. 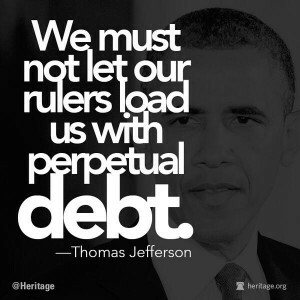 So ultimately Obama’s message is that he wants it 100% his way otherwise he is holding the debt ceiling hostage. So ultimately Obama’s message is that he wants it 100% his way otherwise he is holding the debt ceiling hostage. His legacy legislation must be preserved at all cost, regardless of the impact on the financial stability of the country. And that’s never happened before according to President Obama, but then I guess he did promise us change didn’t he?! 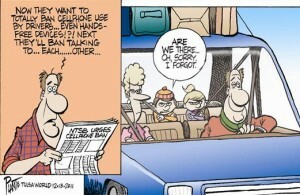 Study shows talking on cell phone while driving does not increase accidents. It’s easy to be surprised. For years, politicians and safety advocates have demonized cell phone use while driving. While most studies have never born this out on a macro level, it’s easy to sell the idea since we all have had an experience with a ‘whoops’ while using a cell phone or can understand that talking on a cell phone might take your attention away from the road. We read the headlines all the time about somebody chatting away happily and then boom! They’re flattened by the train. The researchers at Carnegie Mellon University and the London School of Economics, led by Professor Saurabh Bhargava and Dr. Vikram Pathania, published their findings in the American Economic Journal, in an article called “Driving under the (Cellular) Influence.” They focused on data from the United States between 2001 and 2005, a time when the number of cellular phones was rapidly rising. In addition, phone companies often offered free calls at night after 9:00PM in this time period, meaning that the researchers could identify a time when people were more likely to be using cell phones. This would have also been before handheld phone use was banned by laws and hands-free was more common. Studies show in-person conversation is as distracting as talking on cell phone. The study looked only at talking on cell phones, not texting. But that’s where the effort to ban phone use while driving began. 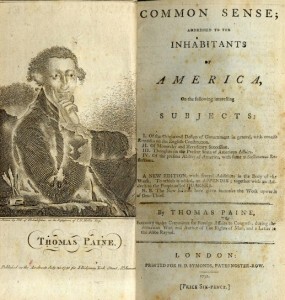 Efforts to reach into the cockpits of cars to dictate behavior, of course, began with the demonization of talking on cell phones, banning teenage use and then banning everyone else. Studies show there’s no difference between holding a phone to your ear and a hands free device, usually the politicians’ default “fix” to their bans. Bhargava, Saurabh, and Vikram S. Pathania. 2013. “Driving under the (Cellular) Influence”American Economic Journal: Economic Policy, 5(3): 92-125. DOI: 10.1257/pol.5.3.92 Abstract We investigate the causal link between driver cell phone use and crash rates by exploiting a natural experiment induced by the 9 pm price discontinuity that characterizes a majority of recent cellular plans. We first document a 7.2 percent jump in driver call likelihood at the 9 pm threshold. Using a prior period as a comparison, we next document no corresponding change in the relative crash rate. Our estimates imply an upper bound in the crash risk odds ratio of 3.0, which rejects the 4.3 asserted by Redelmeier and Tibshirani (1997). Additional panel analyses of cell phone ownership and cellular bans confirm our result. The dire predictions and claims in Oregon Global Warming Report are put to test by scientists who question assumptions made about man’s influence on climate. Man made global warming skeptics are greeting the Oregon Global Warming Report with what you might expect from scientists: skepticism. Al Gore predicted New York would be under water by now and that the Arctic would have no ice. The Arctic has 60% more ice than usual this time of year. New York is still dry. 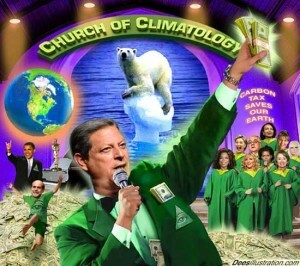 Al Gore has made $100 million + on his Global Warming scare. Climate change is here. Average temperatures in Oregon are rising. · Oregon’s year to date (January – August) temperatures have trended downward at a rate of 0.5 degrees F per decade during the last 20 years. · Oregon’s year to date (January – August) temperatures have trended downward more rapidly at a rate of 1.8 degrees F per decade during the last 10 years. 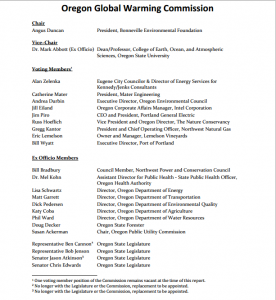 The list of Commission members features Al Gore acolyte Bill Bradbury, environmentalists, corporate types, leftist politicians and one scientist from Oregon State University. 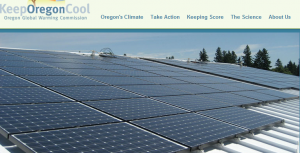 The Commission (see list nearby) also claims Oregon has reduced its greenhouse gas use. These improved and up‐to‐date data indicate that Oregon met its 2010 greenhouse gas reduction goal, having arrested the growth of greenhouse gas emissions and, it appears, also establishing a downward emissions trajectory in which emission levels are expected to be reduced into the future. I’m just a layman, but I would expect that in a great recession with record numbers of people out of work–who have no jobs to drive to, businesses have had to shutter, and production has gone overseas, that there might be reduced output of anything. They’re free to take a victory lap, of course, but where there’s less productivity, there is less CO2 and other greenhouse gasses emitted. The report also assumes CO2 is what drives temperature increases, but that is in dispute. In fact, the rising sea tide is actually turning against that assumption. The problem: too much carbon in the atmosphere. I recognize that there’s only one apparent scientist on the list of Commission members–see it nearby–but isn’t a bit flabby to call CO2 carbon? They’re not the same thing. This has been an ongoing problem with discussion of global warming. C02 and carbon are, for some reason, used interchangeably. Considering this is supposed to be some kind of scientific document, you’d think they put in the effort to be precise (Please see the full report below). They interchange the terms regularly and do separate calculations, both for carbon consumption and CO2. The difference is just the molecular weight of C12 and its isotope burned from fossil fuel and the resultant oxidized atoms of carbon to oxygen forming the CO2 molecule. For those non scientists out there, here’s a wonderful explanation of the difference between CO2 and carbon. Please enjoy reading the report below. More updates will follow.